LeBron James has reached out to Minnesota Timberwolves All-Star forward Kevin Love and expressed a desire for them to play together in Cleveland, front-office sources told Yahoo Sports. Love is enthusiastic about the idea of teaming with James on the Cleveland Cavaliers, sources said. James' decision to sign only a two-year contract that affords him the option of again becoming a free agent at the end of next season has not tempered Love's interest in joining James on the roster. The Cavs and Timberwolves have had ongoing talks about a trade for Love, but a deal is not imminent, said one high-ranking source involved in the discussions. 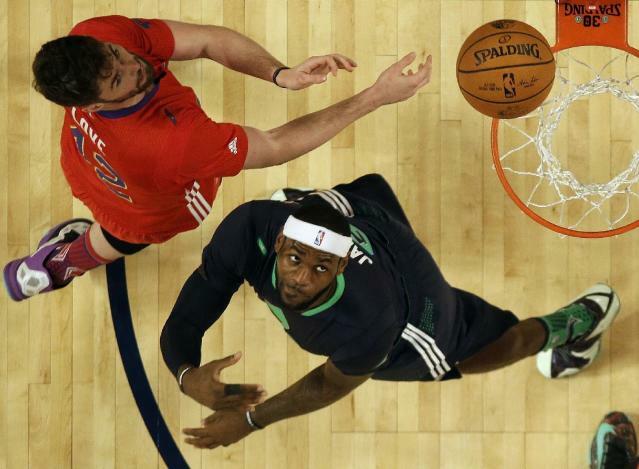 The Cavaliers have shown a willingness to possibly include No. 1 pick Andrew Wiggins in a package for Love, but would likely need additional teams to complete a deal, sources said. Wiggins played for Cleveland's summer-league team Thursday night in Las Vegas. The Timberwolves also have spoken to the Golden State Warriors about Love, but the Warriors have so far been reluctant to include guard Klay Thompson in a trade. Love's representatives have informed Timberwolves management he will opt out of his contract after next season and leave the franchise in free agency if he is not traded. James announced last week he was leaving the Miami Heat after four consecutive trips to the NBA Finals to return to the Cavaliers. He cautioned that the Cavs – who have not made the playoffs since James left in 2010 – would need time to grow into a championship contender, but the addition of Love could greatly accelerate that process. Cleveland also signed All-Star point guard Kyrie Irving to a five-year, $90 million extension this month.